Do you need to email documents from a 3rd party system but want to use an email address from Sage 200? Alternatively you may want to email a Sage document using an email address from a 3rd party database. Recently we had a customer looking to email Invoices out of a 3rd party system, but they wanted to use a specific email address set up in Sage 200. We got around this using Spindle Professional. I have come across a couple of issues relating to Emailing documents from Sage 200. At one of my sites recently users were using had a mixture of Outlook 2010 and Outlook 2013. I had configured all layouts for email set up to use MAPI as the Mail provider. 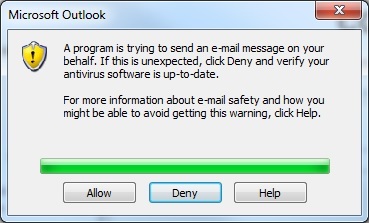 The first issue this brought up was for every email Sage tried to send, an Outlook security warning would pop up. This is not so bad for users if one or two emails are being sent, but imagine how this is for a batch of 100+ statements! NB. In Outlook 2000 and 2003 the security update is installed separately, however it is built into Outlook 2007 and above. For Outlook 2013, there are Programmatic Access security settings which are generally controlled at a Group level. These should be enabled. In Sage 200 2013 and above, this issue doesn’t occur if the report or layout has the Mail Provider set to Outlook instead of MAPI. Having changed the Mail provider to Outlook on the layouts at my site, this identified another issue but this time for users of Outlook 2013. 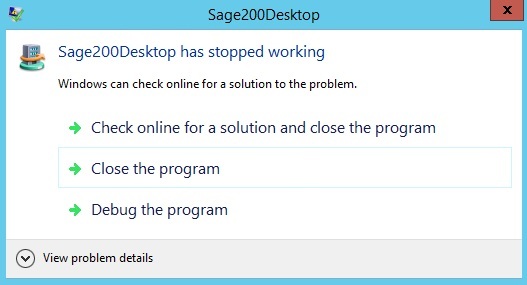 With the Mail Provider set as Outlook, when attempting to Email a document, a message appeared to advise that the Sage200Desktop.exe has stopped working. Troubleshooting detected that although this issue occurs for Outlook 2013, it only occurs when using Windows 8/8.1 or Server 2012/2012R2. Windows 7 machines were fine. This is a known issue with the Sage report designer (so impacts Sage 50 and payroll also). The problem I had for my site was the resolution is to switch the layout Mail Provider to MAPI……..! NB. The Sage200Desktop.exe has stopped working error can also occur when the Mail Provider is MAPI and Outlook is closed when attempting to Email the document. Upgrade all users to Outlook 2013 and set all layouts to use MAPI. With the price of stamps increasing today (First Class from 46P to 60p, and Second Class from 36p to 50p) it is as good a time as ever to think about how you are distributing documents to your customers, suppliers and may be even between colleagues who are at different sites. Sage 200 has the facility to cut down on postage already built-in. All documents and reports can be configured to email contacts either automatically or manually. The automatic configuration can utilise the Roles and Contacts within the Sales and/or Purchase Ledger to send documents to the required email address. Click here to see my previous post about emailing documents out of Sage 200. As well as the standard Sage 200 functionality, there is also the add-on option. Spindle Professional is an add-on for Sage 200 that aids in the distribution of documents. Spindle is capable of much more than just emailing documents as you can configure a document to be Emailled, Faxed or Printed based on the contact details available in Sage. As well as the Distribution options you also have the ability to add backdrops to documents (these are basically electronic stationary layouts), you can attach other documents as part of distribution (for example attach the relevent Despatch Note when sending an Invoice), there is also the ability to Archive documents that have been sent out. Spindle Professional can also be used with other software, so you could create a Word document and distribute it as necessary. Both of the above options that you have with your Sage 200 software will save you money in relation to Postage as well as Paper, Envelopes, Stationary and Time. I recently blogged about how Sage 200 is capable of distributing batches of documents via email. This has prompted the questions from a number of followers regarding the need for Spindle. For some people the Sage 200 functionality will be enough, at least to start with. However, my personal opinion is that Spindle Professional is a must for any Sage 200 site. It offers so much more than the ability to email a batch of documents and anyone using Sage 200 would benefit from adding Spindle Professional to their system. During implementations of Sage 200 I nearly always find a reason for talking about Spindle Professional and simply talking about what it does and how it can benefit the customer is often enough for them to purchase it. The Benefits and Cost Savings that companies gain from using Spindle Professional with Sage 200 are massive. Multiple Distribution methods in one click – Email, Fax or Print documents – You could have a batch of documents (invoices for example), and by printing the batch through Spindle each individual document will be sent out as required. Send Multiple Copies to Multiple Destinations in One Click – For example, you may have a batch of invoices. You want to send each invoice to its customer as they require (Email, Fax or Print). At the same time you may want to send a copy to the relevant Sales Rep and/or generate a copy for the accounts department. A Spindle Automation can be set up to do all of this in just one click. You could even save a copy (Archive) to your Network/CRM/SharePoint at the same time. Backdrops – Documents can look professional with the use of backdrops replacing pre-printed stationary. Cost Savings – This really can be huge. Consider this: If you currently send 500 Invoices a month by post and begin to send 60 % of these via Email or fax, you could see savings of around £300 a month. Now consider all of the other documents that you send out!!! Money will be saved on postage, paper, envelopes, pre-printed stationary, printer cartridges….. etc. Time – No more or at least reduced time sorting print outs, stuffing envelopes, franking everything etc. Use data from Sage 200 – Subjects, attachments and Messages sent with the documents can include information from the Sage 200 database with the use of commands. This allows you to make messages more personal to each company, rather than having a generic message. Easy to use – For most users all they will need to learn is to select a printer called Spindle, and consider that this can be defaulted on the Sage document templates! Use with multiple systems – Send Microsoft Office documents for example a letter, or a Mail Merge. So is Spindle Professional a benefit to Sage 200 users?………….YES!! !